Authors and critics alike have attempted to describe and define the short story, from Edgar Allan Poe and Brander Matthews over H.E. Bates, Frank OConnor and Elizabeth Bowen to contemporary critics such as Clare Hanson or Valerie Shaw. Notions on what a short story is, how it can be defined or how it ought to be written vary widely, and it is certainly no easy task to sift through the existing material and present it in a reader-friendly, introductory format. 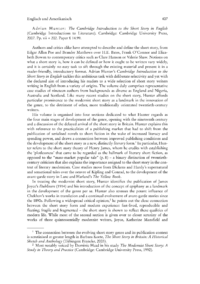 Adrian Hunters Cambridge Introduction to the Short Story in English tackles this ambitious task with deliberate selectivity and yet with the declared aim of introducing his readers to a wide selection of short story writers writing in English from a variety of origins. The volume duly comprises representative case studies of nineteen authors from backgrounds as diverse as England and Nigeria, Australia and Scotland. Like many recent studies on the short story, Hunter affords particular prominence to the modernist short story as a landmark in the innovation of the genre, to the detriment of other, more traditionally orientated twentieth-century writers.